In search of the legendary Fountain of Youth, Ponce instead discovered the Upper Tampa Bay area in 1513, though – like many others since that day – he had no idea what he’d stumbled upon. The New World explorer took his act elsewhere, and it was another three centuries before we reappeared on the world’s radar … this time thanks to the establishment of the Florida Territorial Government in 1822, and the initial settlement of what would eventually become the city of Tampa the following year. When the Native Americans got restless on Florida’s East Coast in 1832, Count Phillippe Odet of France moved his encampment to Safety Harbor, introduced citrus trees to the area, and promoted the area as a “land of opportunity” for European settlers and American adventurers. You might call him West Central Florida’s first land speculator … and he did his job well! In 1860 plantation owner William Mobley moved to Upper Tampa Bay from Savannah, Georgia, bring with him his extended family … including a family of black slaves. They settled in the Citrus Park area of Northwestern Hillsborough County, on a 2,000 acre spread that included a sawmill, a cattle ranch and a turpentine still. Mobley freed his slaves when the Civil War ended, and gave the Allen family 20 acres of land. The enterprising Allens bought another 45 acres, planted the area’s first citrus groves (which eventually gave the area its name), and turned their farm into a veritable breadbasket for Upper Tampa Bay, harvesting nuts, sugar cane and vegetables, along with beef, poultry and pork. Cornelia Allen ran the first general store in the area, which operated on Boy Scout Road from the 1880s through the mid-1920s. The region’s first schoolhouse – the Keystone School – was built in the late 1880s, and served the area well until the “Little Red Schoolhouse” (which still stands on Gunn Highway, near Citrus Park Elementary School) was completed in 1911. Two years later, an event occurred which changed the face of the Upper Tampa Bay area forever. R.E. Olds – the inventor and manufacturer of the Oldsmobile – took his auto industry millions and purchased 37,000 acres of land at the northernmost tip of Tampa Bay, intent on building a city of 100,000 residents complete with luxury hotels, a thoroughbred horse racing track, golf courses, beaches, a shipyard, factories, oil wells and prestigious residential developments. Olds – the founder of the modern-day City of Oldsmar – was obviously a man ahead of his time … if not a man with good timing! After spending eight years designing and developing the tree-lined boulevards which link Oldsmar’s bayshore with downtown, then building a 60-room hotel, grocery, drug and hardware stores, a library and school, restaurants and cafes, dairy farms and plantations – and even a waterside casino – a powerful hurricane hit the city in 1921, devastating the Oldsmar area and the man who gave it his name. By 1923 R.E. Olds’ “city by the bay” had a population of only 200, just one major factory had settled in the area, and Olds had sunk more than $4.5 million into his 10-year real estate experiment. Disenchanted and disappointed, Olds began liquidating his assets, trading the newly completed racetrack (now known as Tampa Bay Downs) for the Fort Harrison Hotel in Clearwater, and eventually leaving the area altogether after taking a $3 million bath. When the Gandy Bridge was built in 1924 – followed by the completion of the Courtney Campbell Causeway in 1934 – traffic no longer had to travel through Oldsmar to go between Tampa and the St. Petersburg / Clearwater area. For the next 50 years, until the early 1980s, Oldsmar remained a sparsely populated backwater town, as the rest of the Tampa Bay area grew up around it. Until the 1950s, the area now known as Town ‘N Country area was pretty much one big cattle ranch, supplying beef and dairy products to a burgeoning Florida population. But all that changed in 1958, when the LaMonte-Shimberg Corporation bought a 525-acre dairy farm from the D. Wayne Webb Family, and began development of the Town ‘N Country Park subdivision near the intersection of Hillsborough Avenue and Memorial Highway. By the time they were done in 1978, LaMonte-Shimberg had built (and sold!) more than 8,000 single-family homes and townhouses in Town ‘N Country, and others were doing the same. The term “Town ‘N Country” today describes a much larger portion of Hillsborough County than originally envisioned, bordered by Pinellas County/Oldsmar on the west, Tampa Bay to the south, Tampa International Airport on the east, and Linebaugh Avenue to the north. Upper Tampa Bay … Today! Florida’s population explosion finally reached the Upper Tampa Bay area in the late 1980s, as Tampa approached build-out and Pinellas County blossomed into the most densely populated county in the state of Florida. 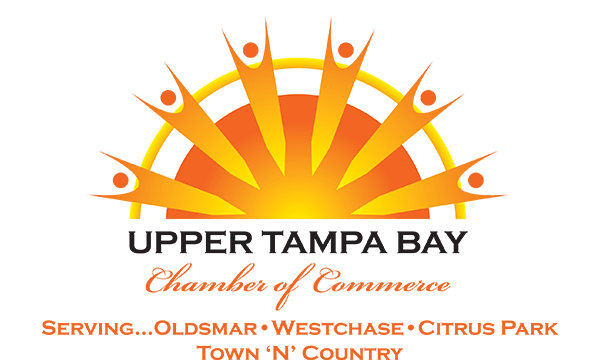 Today, more than 200,000 people live in the Upper Tampa Bay area, which stretches from U.S. Highway 19 on the west to the Veterans Expressway on the east. Some 14,000 live within the Oldsmar city limits, while the rest reside in the unincorporated areas of Pinellas and Hillsborough counties … primarily in Pinellas County’s prestigious East Lake area, and in the many upscale residential communities scattered throughout Northwestern Hillsborough – Westchase, Countryside, the Eagles, Citrus Park, Keystone and Odessa.